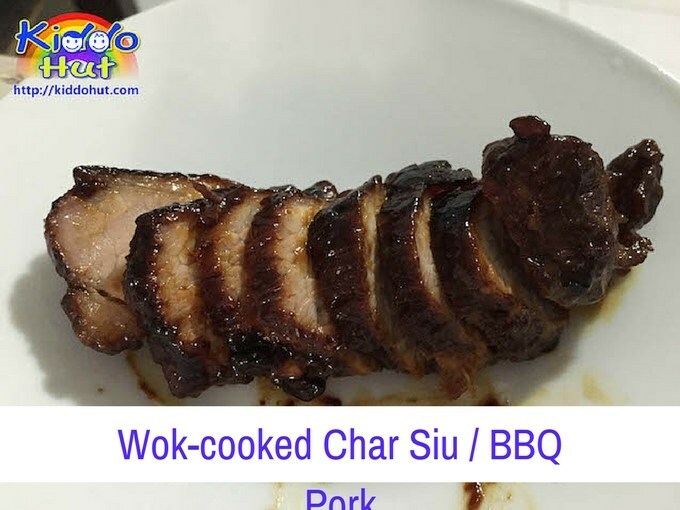 Why the name ‘Wok-cooked Char Siu / BBQ Pork’? It is because this Char Siu is cooked using wok rather than oven. My twin toddlers love Char Siu but those stall-bought are usually cooked with oyster sauce, lots of sugar and colouring which I find unhealthy for them. From a cooking page on Facebook, I was directed to this recipe – The Food Canon’s Auntie Rudy’s Char Siew. I made this a couple of times and made some modifications to the ingredients and methods. I have omitted oyster sauce, sugar and chinese wine, and increased the amount of honey to replace oyster sauce and sugar. As I am preparing the Char Siu for my kids, I didn’t use wine. The taste turns out great and satisfying! In fact, there is no need to add sugar. At least, I know my family is enjoying good food without added stuff which I prefer not to have. I used the meat from the leg part of the pig (“twee bak”), preferably the front leg instead of pork belly as the earlier is less oily and more tender. 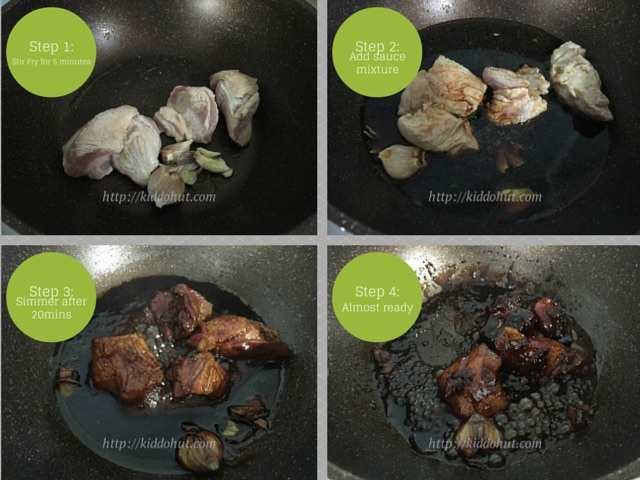 To ensure the pork is easily cooked, cut them into 3 – 4 strips for 500g of pork. Do cover the wok during simmering and check the water level, adjust accordingly but do not add too much water to avoid dilution of the sauce. Flip the meat while cooking so that it will cook nicely on both sides. To check if it is cooked, cut a piece out to try. I didn’t caramelise the meat after it is cooked as I didn’t like charred char siu which is also one of the reasons why I don’t like those stall bought. Without caramelising it till some parts are charred, the taste is still great. Now with the Char Siu, what can you go with? Plain white rice, some Chinese parsley and cucumber. Or, make some Fan Choy. For the Fan Choy’s recipe, please click here. You can wrap the Char Siu with Leaf bun. How to make leaf bun? Click here. Note: Original recipe cooks the sauce mixture with 900g pork. If you do not need the sauce, just cut the ingredients by half. The picture you see below was half portion of the ingredients except the garlic, I leave it at 3 gloves as we love the smell of garlic. 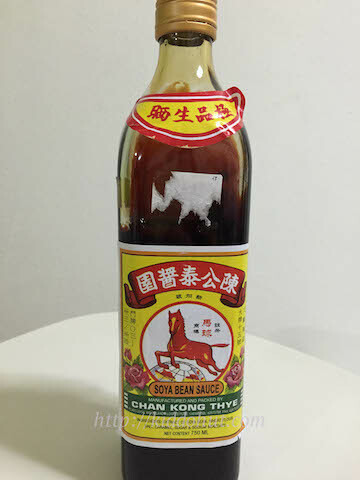 This is the brand of soya sauce I used and the taste was fantastic! 1. Mix all ingredients except the pork and garlic in a bowl. 2. Heat oil in wok. Add pork belly and garlic, and fry for 5 minutes. 3. Add the sauce mixture and let the pork belly simmers for 45 – 50 minutes under low heat, covered. Depends on the size of the pork belly, you may need to simmer for an hour. Check the water level and adjust if necessary. To test if the pork belly is cooked and tender, cut a piece to try. Remember to turn the pork belly to ensure both sides are cooked and coated with the syrup. 4. Remove most of the sauce. 5. Caramelise the meat in medium heat. Add some honey and sear 1-2 minutes per side. 6. Coat the done Char Siu lightly with some honey.